Here Ya Go. The Winning Doodle! – Hey, Look! A Writer Fellow! Next postHere Ya Go. The Winning Story! Awesome doodling there Mike as always! Thanks, Al. I tend to only sketch when the doodles are just for the blog. Contest winner “sketches” get a little extra time and TLC. Wonderful, I want to win one week! Then I can count on you entering my next contest in July, yes? I can’t wait either. I better get started. I had a challenge with a fellow writer a while back to do the same type of thing. It certainly was challenging but fun! Awwwww, they’re adorable! 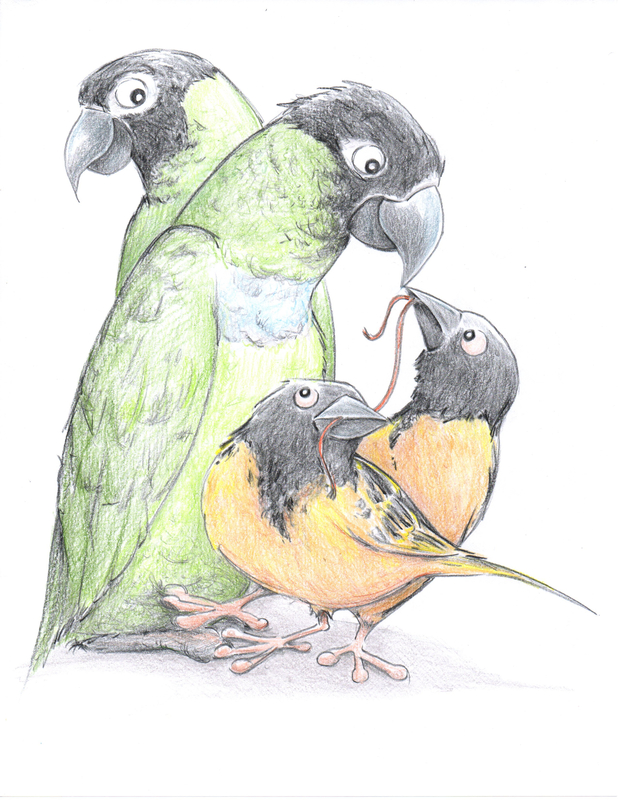 You adorably doodled four adorable birds!! I know Jo must be thrilled. Can’t wait to read your story! I’m told I do adorable well. Aside from your love of sprouts, I would consider you quite wise. Brilliant. If I had to draw birds they would all look like Woodstock in the rain. You do know who Granny Weatherwax is, don’t you? I suspect you would adore Terry Pratchett’s Discworld books. I do not know Granny Weatherwax. I do, however, know that Ken Weatherwax played Pugsley on the Addams Family. I have not forgotten your rhino on a tricycle idea, BTW. Thanks, Oscar. If you want to enter the next doodle contest, be sure to keep checking out this blog! Believe it. Due to my schedule I haven’t given the words much thought. But I’ll figure something out. Writing on Demand is what I do for a living. Fun flock! Will surely inspire a fine feathered fable soon enough. Not much of a bird fan, I’m afraid. They poop on my car too much for that. Mike, this “doodle” is awesome! Looks like Button’s not quite sure about giving up his shared worm. I was expecting to see two of the birds wearing funny masks, from J’s description (“two masked weaver bird boys”). Fortunately Jo provided me with a few photos so I’d know what the heck a masked weaver bird was. It’s wonderful as always! Great detail. Thank you, my friend. I never had much experience drawing birds, so this was a new one for me. I’d prefer to illustrate a cow joke book. Still looking for a publisher with sense. To err is human, to laugh bovine. Congratulations Jo! I like that it’s about your own birds, which makes it extra special. Can’t wait to see the story. Unusual words, you may need a sugar/caffeine fix. That’s a good idea. I’ll make me a coffee milkshake. Thanks, Julie! A doodle compliment from an artist with your talent always means a great deal to me. Ooooh, you outdid yourself, Mike! No one will ever call you a bird-brain. Bird artist, yes. Guess you’re extremely happy that she didn’t ask you to draw a feline, like a cheetah or lion. Can’t wait for the story! Oh, I’ve paid my dues with feline drawings, I think. By the way, love the doodle and a story idea. Thanks, Mrs. P. But I think my story will be nonbird-ish. Whatever lush it is, I’m certain we’ll like it! Thank you so much Mike – it’s absolutely beautiful, and you’ve got their little characters right on their faces. Most definitely a family heirloom! You’re an awesome artist even when you call your masterpieces doodles. I can’t wait for the story – you’ve really never read Pratchett? Have you ever had a seagull poop on your car BTW? Really can totally cover a windscreen on a good day for the birds. 🙂 Thanks again – I love it! And this is the comment I’ve been waiting for! So glad you like it, Jo. I’ll send it off to you this week. Yep, I’m with the other commentators. Awesome little doodle. Beautiful! I hope you got the birds correct. I assume you had to do some research to see what they look like first. You’re a regular Audubon! They are correct in a cartoony way. I was aided by a few pics from Jo. While I’m a bit disappointed I didn’t win, I am happy for Jo. Love the drawing! I’m curious, how many “contestants” did you have in all? Dang, Ragamuffin, I don’t know how many entrants there were. I’ll just put it at “a lot”. Great!!! Cant wait to read the story!! Just posted it! Here’s hoping you enjoy it, Sassy! That’s just nuts! Stop procrastinating! You could write BOOKS (plural!) about Zimbabwe! And where is the jelly and Weatherwax, smartypants? You are a talented guy Mike! 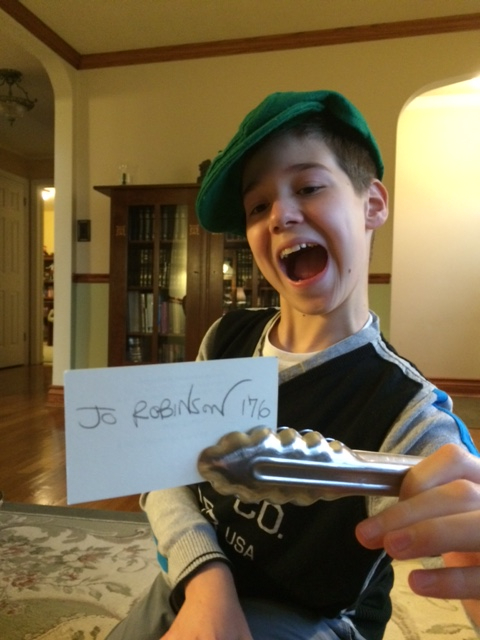 (seriously) Awesome – also love your lad’s use of the tongs! No question of impropriety or tainted entries here! Thank you, my friend. And you are quite right; the esteemed judge (and his tongs of selectivity) is fairer than fair. There’s a superhero hiding somewhere behind that image – might explore that someday. Salad Man and his tongs of sensitivity – can toss criminals asunder from 40 feet.